Around half of schools start teaching GCSE content when pupils are still in year 9, while some teach the courses to pupils as young as 11, a major new survey of teachers suggests. The National Foundation for Educational Research surveyed 1,678 teachers from 1,439 schools for its annual Teacher voice omnibus survey. Fifty-six per cent of respondents said their school started teaching the GCSE curriculum for “most if not all” subjects in year 9, while a similar proportion, 53 per cent, said the number of GCSEs on offer at their school has been cut. 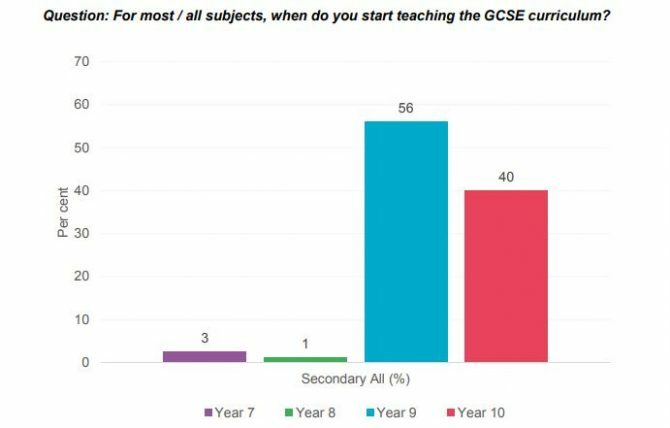 But some schools appear to be starting even earlier – 3 per cent of respondents said their school started teaching GCSE content in year 7. The survey is not the first to highlight an apparent narrowing of the curriculum at schools across England, which leaders put down to new performance measures, such as Progress 8 and the EBacc. Government ministers and Ofsted chief inspector Amanda Spielman have warned against the practice. Last year, the Department for Education’s own school snapshot survey found pupils in year 9 were expected to start studying for key stage 4 in all subjects in 35 per cent of schools. NFER’s survey results have been published alongside the organisation’s response to the consultation on Ofsted’s proposed new inspection framework, which is set to come in to force in September. Under the proposals, Ofsted will increase its focus on ensuring schools teach a broad and balanced curriculum. But according to the Teacher Voice Omnibus survey, only 68 per cent of staff agreed that their school offered a curriculum with “breadth and depth” at key stage 4, while 22 per cent said it wasn’t. Accountability measures were cited as the most common reason for fewer GCSE subjects being offered, with 35 per cent claiming they were dropped because they “did not fit with Progress 8”. This factor was closely followed by staff shortages, which was cited as a reason by 32 per cent of respondents. Under Ofsted’s proposals, schools will be inspected on the intent, implementation and impact of their curriculum design, with a move away from focusing on pupil outcomes and data. But NFER warned today that the shift away from data could make staff believe Ofsted is no longer interested in hard numbers. As such “there is a risk that school leaders and teachers may stop using data to self-improve altogether, resulting in many good practices being lost”, said the NFER in its official response to Ofsted. The survey showed 79 per cent of school leaders supplied internal data to Ofsted to provide “greater context about performance and outcomes”. Ofsted should “develop guidelines for schools explaining how using appropriate data can help to drive improvements” in learning, and “provide examples of where this has been effective”, said the NFER. The inspectorate could also provide examples where data has not added value, they added. Carole Willis, chief executive , said she supported Ofsted’s efforts to ensure inspections don’t result in unhelpful data collection, but added “school leaders can and should be using proportionate data to manage their schools”.